Camping La Palmeraie - now with a brand new waterland! Welcome to Camping is one of the most attractive camping sites in all of France located on the extremely popular Languedoc-Roussillon. 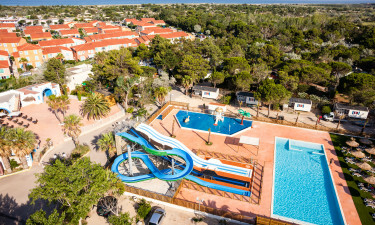 Situated on the Mediterranean coast in the Languedoc-Roussillon area of southern France, this campsite is rated with three stars and is only 1 kilometre from an excellent Blue Flag beach with sand dunes. La Palmeraie luxury camping site opens from April to September and if you are travelling with the family dog, your pet will be welcome. If you have already decided to book your camping holiday at La Palmeraie with Lux-Camp, please feel free to get in touch. What is camping at La Palmeraie like? Lux-Camp provides mobile home accommodation. Electricity is supplied. The campsite trees, gardens and greenery add an extra luxurious feel to the camping luxury on offer in a selection of mobile homes, ideal for enjoying the fresh air and countryside from spring to autumn. In summer, the large palm trees provide plenty of shade from the sun, giving the campsite the sensation of a refreshing oasis in natural surroundings. As one would expect, the mobile homes have all modern comforts. The nearby Blue Flag beach is wide and sandy, ideal for swimming and surfing. On site, there are two pool areas to exercise or relax - for adults there is a swimming pool and aqua gym while children and teenagers can play in the multi-sports area with five slides. There is also a covered pool. 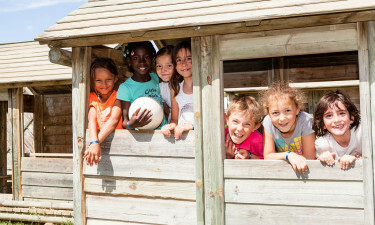 Additional activities include a choice of ping-pong tables and a children’s club with organised games. In the evenings, there is an entertainment programme with live performers and themed events. Nearby, there is a zoo and the nearest town, Frejus, is just 3 to 4 kilometres away. Other activities in the surrounding area include a water park, a nature trail (the Francois Leotard route) and diving and snorkelling from Port Frejus. You may also like to visit the Marine Troop Museum, the cathedral or the botanic gardens. For hill walkers, Mont Vinaigre offers excellent panoramic views of the area. 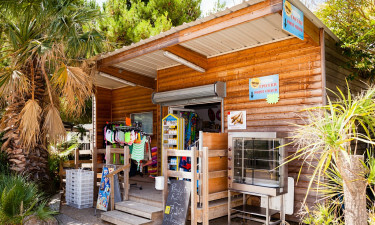 If you are thinking of exploring the area, La Palmeraie campsite is conveniently located for the A-8 motorway - near Sant-Raphael, south of Nice and Cannes. Marseilles and Toulon are further southwest. Site facilities include a supermarket, snack bars and a restaurant serving food from a Provencal menu. Olive trees provide ambience and shade to some of the tabled areas on the terraces. If you have already decided to book your camping holiday at La Palmeraie with Lux-Camp, please feel free to get in touch.